Would you dare to thrash these? Chanel‘s accessory output is legendarily diverse. Under the leadership of the recently-passed Karl Lagerfeld, the legendary fashion house introduced branded ice skates, motorcycle helmets and feathers. For Spring/Summer 2019, Lagerfeld left fans with another selection of covetable creations, including another take on a surfboard. One of the French company’s most playful designs, the Chanel surfboards are practically a thing of legend. SS19 sees the label serving up a tonal silver board crafted from aluminium, glass and polyurethane, emblazoned with the interlocking “C” logo towards the end. For those seeking a slightly (very slightly) more affordable plaything, Chanel SS19 also boasts a mini cruiser-style skateboard. Crafted from black lacquered wood, the trim deck sports glistening grip tape up top and an embossed panel for the interlocking logo, also executed in black. White wheels and hardware offer a clean complement to the upper, while the rear side features an embossed quilting pattern and branding, a nod to one of Chanel’s signature techniques. 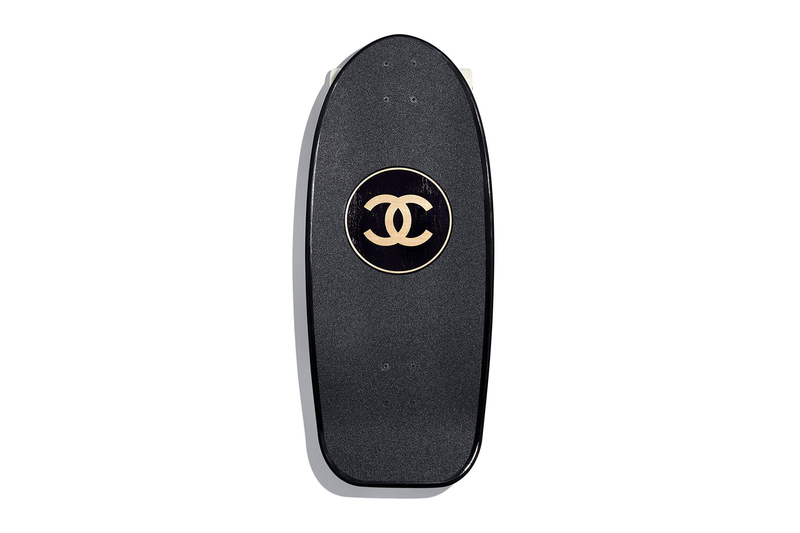 Chanel’s web store hosts the skateboard for $7,700 USD and surfboard for $8,900 USD. Below, relive the beachy Spring/Summer 2019 presentation. Most recently, we relived Lagerfeld’s major fashion contributions. Off the ‘It’s Crazy But It’s True’ project. This year’s lineup is stacked.